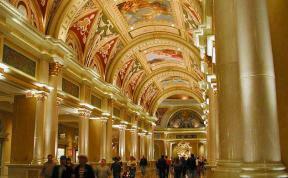 The Grand Canal Shoppes at The Venetian combines Old World charm with the newest and best fashion designers, and retail stores and world-class dining. Names like Kenneth Cole, Movado, Mikimoto, Paige Premium Denim, Dooney & Bourke and Peter Lik Gallery create a retail environment that could rival even the most fashionable streets of Italy. Part of the Shoppes' allure comes from the classically trained singers, actors and musicians that giving the shopping center a charming "Streetmosphere." Daily performances in the center's St. Mark's Square creates an added element to the shopping experience and making the entertainment of an attraction all its own.